We've revamped our emailing system for contacting your entrants and group members, here's a run-down of the changes and new features. 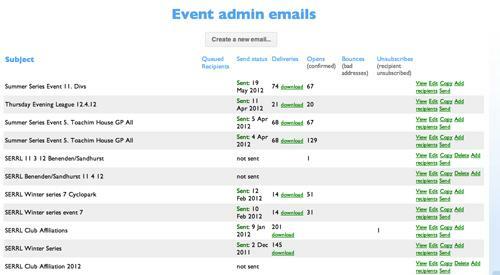 Opens: How many people have opened your email, more info on how we track this. 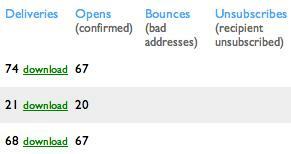 Bounces: Bad addresses - i.e. we couldn't deliver your email because the recipient didn't exist, or an error was encountered. These will tend to tail off because once encounter a bad address we won't attempt to deliver future emails there (a bad address could be as simple as a mis-spelt email, such as: 'jack@yahooo.com'). Unsubscribes: We give recipients the option of unsubscribing from further emails - this shows how many recipients unsubscribed. You can also download a list of all the addresses your email was sent to and at what time. Enter an address where recipients may reply (this is initially set to your address, but you can change it), a subject and the main text of your email in the box below. You can now insert graphics into your email (e.g. your logo, or photos) using the 'add picture' button, and also upload attachments. If you have sophisticated formatting requirements you can edit the 'HTML' of the email directly, though if you're not familiar with HTML it's simpler to just stick to the standard ' WYSIWYG' mode. Here you can select any and all of your entrants, and/or group members to send the email to. 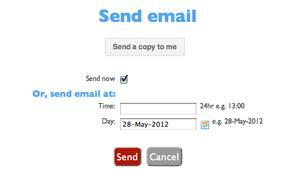 Finally, the send email screen where you can start sending right away, or schedule the email to go out in the future. You can also use the 'send a copy to me' to send yourself an email immediately, so you can check how it looks in your email programme. The main email screen will now show the 'queued recipients' waiting to receive this email and the time at which email delivery will commence. You can delete these recipients from here or click 'view' to see their email addresses. Hopefully you'll find these features useful, let us know if there's anything we've missed out!